A simulated residence hall room fire. Photo courtesy of UK Fire Marshal. 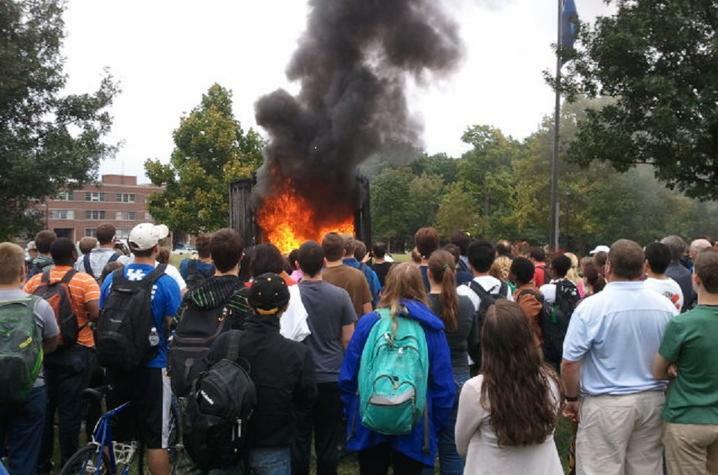 LEXINGTON, Ky. (Sept. 8, 2017) — The University of Kentucky Fire Marshal's Office kicks off its annual fire safety campaign during the month of September with several events planned including a dramatic demonstration of how quickly a fire can start in a residence hall room. Now in its 14th year, National Campus Fire Safety Month is recognized during September at college campuses throughout the country. This year's theme is “Don’t Wait Around When The Fire Alarm Sounds!”. Although fire safety is highlighted during September, the UK Fire Marshal's Office is responsible for maintaining a fire safe campus and actively engaging in fire prevention and life safety throughout the year. The UK Fire Marshal’s Office will conduct several events on campus throughout September, including an event from 10 a.m. to 2 p.m. Thursday, Sept. 21 (NOTE: This is a different date than when the story first published. Event date changed due to expected rain), at the Woodland Glen/Hilltop area across from The 90. In addition to offering fire extinguisher training, cooking safety advice, fire safety tips and a free T-shirt giveaway, the Fire Marshal's Office will conduct a fire demonstration around 11:45 a.m.
“We literally build a room to the same specifications of a typical resident hall found on our campus using the same building construction materials and furniture. We introduce a small flame to it and let students watch it develop until it is free burning,” Ellis said. “It shows how quickly a dangerous situation can develop and stresses the importance of reacting immediately and evacuating a building if a smoke detector or fire alarm sounds. Wednesday's event will also include the UK Police Department's division of Crisis Management and Preparedness in recognition of September also being National Preparedness Month. The UK Fire Marshal’s office conducts fire safety training, evacuation and fire drills, and offers free fire extinguisher training for all UK and community constituents. They are also responsible for fire and life safety inspections for all UK facilities, code enforcement, and plan review for all construction projects up to $1 million. For more information about UK’s schedule of fire safety events, upcoming fire drills and classes, fire safety tips, and fire extinguisher training throughout the year, visit the UK Fire Marshal's website at http://ehs.uky.edu/fire; follow them on Facebook and twitter @ukfiremarshal; or contact Jason Ellis at jasomellis@uky.edu and at 257-6326.